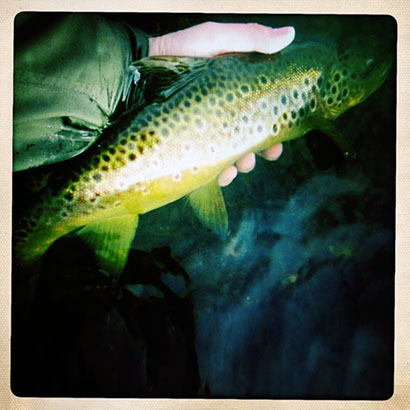 Of all the fish that swim, the one that has surely got life sussed beyond all others is the slob trout. There are arguments as to his true origin, though it is widely believed that the slob trout is a brownie (Salmo trutta) who, having spawned, then drifts downstream until he finds the food-rich estuarine water where he spends the rest of his days in a state of idle indulgence. Of course, as we know, the brown trout is known already for occasionally going to sea, but before becoming a migratory sea-trout must first become a smolt – whereupon physiological changes occur that enable a freshwater fish to cope with the high salinity of the sea. A slob trout makes no such change, but is able (like many fish) to cope with brackish estuarine water. William Yarrell, the 19th Century taxonomist believed that the slob trout (or bull trout as he called it) differed slightly from the brown, and therefore classified it as a separate species with the latin name Salmo eriox. His theory was disproved however, and though less widespread than in Yarrell’s day, the slob trout that swim today in estuaries such as the Tamar are nothing more than lazy brown trout.